I’ve been going through all the boxes of old paperwork in my garage attic—there were a lot of them—and I stumbled across one of my old columns. How old? Well, so old it’s never appeared online. There was a time when stuff didn’t appear online. No, really. Since time has been very short lately (see above note about going through stuff, and also recently born grandbaby), I’m posting this as my annual Christmas column, a little more faith based than my usual fare … and you’d have never known it wasn’t brand new if I hadn’t told you. Well, except it mentions my youngest daughter’s fascination with Sailor Moon, which dates back to the turn of the century. I’m typing this in without reading it first … I wonder if it’s any good? To keep the kids happy, and thus stop abuse. And a lack of the same could make my life unpleasant. Because one still knows Santa, and the other’s a teen. Comics, two dolls, and all things cartoon. And she wanted orange clothing—don’t’ ask me why. Begging for mercy while I wore down its face. My bank account suffered, collapsed, and then died. No team from “ER” could keep it alive. Headlong for bankruptcy, I found myself hurrying. Yes, I was broke, but I wasn’t worrying. And that seemed to me the way to be living. I thought it was crashing! Almost emptied my bladder. But it said “nothing detected” so it wasn’t the worst. And suddenly Santa appeared with a “whoosh”. Although no longer fat, he still had that grin. “My wife gets the credit for the shape that I’m in. “You’re looking good, Santa,” I had to agree. “But Santa,” I told him, “I’m into the spirit. This stuff isn’t for me—I wouldn’t hear it! He shook his head sadly. “You just don’t understand. A big present exchange isn’t what should be planned. What good does it do? What do your kids learn? I sat there in shock—didn’t know what to say. This didn’t sound like our Santa today. “Why do you say this? You sound kind of blue. “It was different before,” Santa said with a frown. “There wasn’t this focus on cost all around. “Do you think what they want, or what you think is nice? Do you buy best for each, or balance out price? I know you like giving, but is that what they learn? In the meaning of Christmas if He’s not in your heart. And you know who He is! So get off your can. And then he was gone. He left no gifts from his sack. About gifts and cards and the holiday hurry. But Santa’s not the Big Guy of the season, you see. So relax and have fun … don’t just load up the tree. 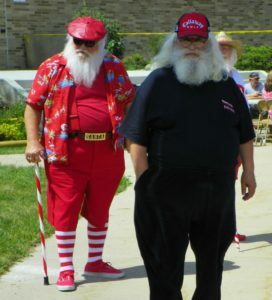 It’s the Santa Mafia! And they’re going to make you a present you can’t refuse.